For many of us, our bike is more than just an inanimate object that gets us from T1 to T2 – it is our pride and joy. And because of that, we only want the best for it. Whether it’s the garage, a guest room, or closet, the area where we store our bike serves as one part showroom another part workshop. It’s the place where we keep our bike maintained (and on display) year round. 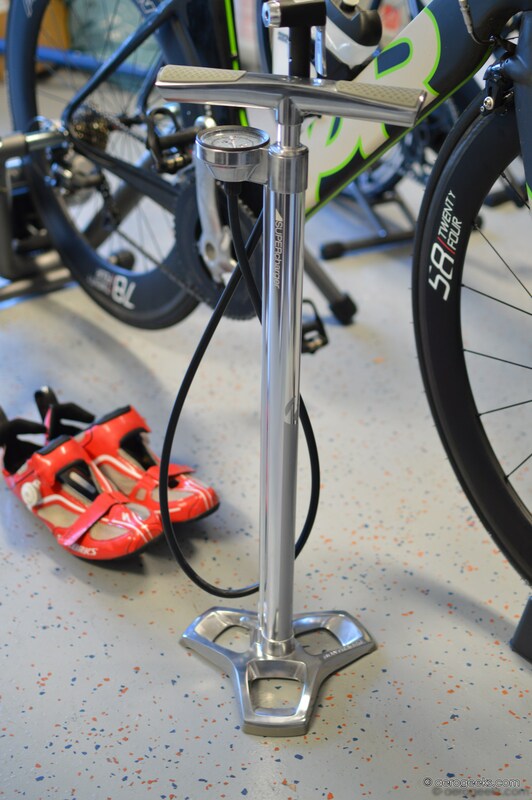 So why settle for an ordinary floor pump? We want a pump that works incredibly well and looks great, too. That’s why we loved Bontrager’s new Super Charger. It’s as much at home on our garage floor as in a trophy case. The Super Charger’s aluminum construction looks incredible and is light weight. 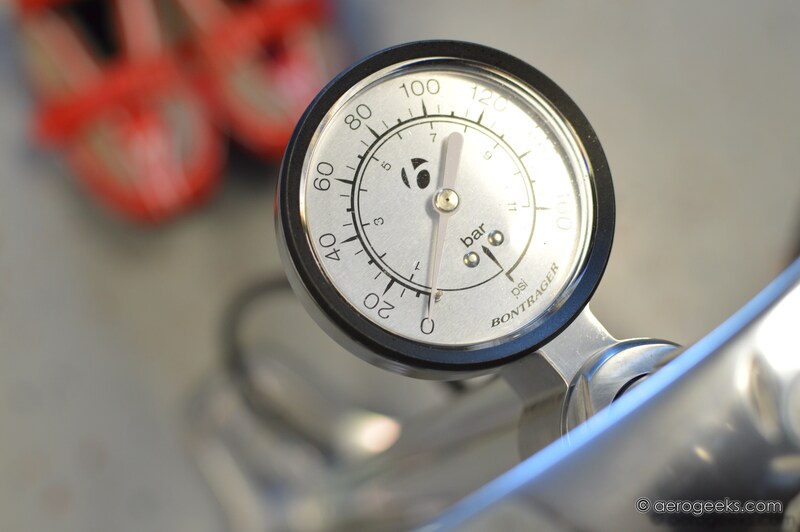 The 2.5” gauge is located at the top of the pump and is very easy to read while pumping. The pump has a triangular base with large rubber footpads that minimize tipping. We rarely went wanting for extra support. The handle is extra-large and features comfortable rubberized grips. 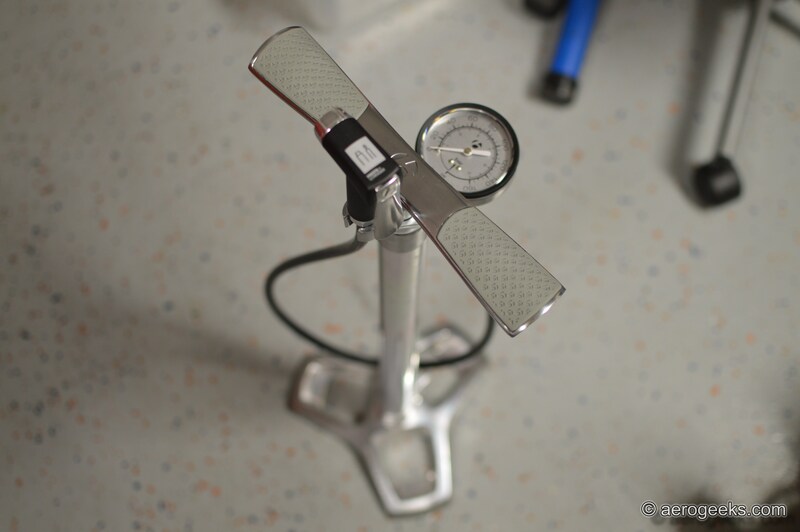 The head is located at the end of a (quite long) 114cm hose and supports both Presta and Schrader valves. One of the things we really noticed about this pump was how well it worked with valve extenders. In the past we found that some pumps simply don’t play nice with the open extenders that typically come packaged with most wheels – the Bontrager had no such issue. Our only complaint about the pump is that the head does not like to stay in its clip at the top of the pump when not in use. The clip does not fully secure the base of the pump head and more than once we inadvertently knocked the head out of the clip. All of this doesn’t come cheap, however. At $109.99, the Super Charger is certainly not the most economical pump on the market. But for those who want a high-quality pump that’s built to last and look fantastic – the Super Charger may be exactly what you’re looking for. Regarding the pump head not staying in its clip on the handle, not sure if you noticed but there’s a hook at the base of the pump that you’re supposed to route the hose through prior to lodging the head in the clip. This will provide enough tension on the head to stay in the clip. Thanks for the great reviews and keep up the good work!